Cougar big man Jacob Sauls looks skyward after rejecting a shot attempt by VC’s Rikki Mazzetti. 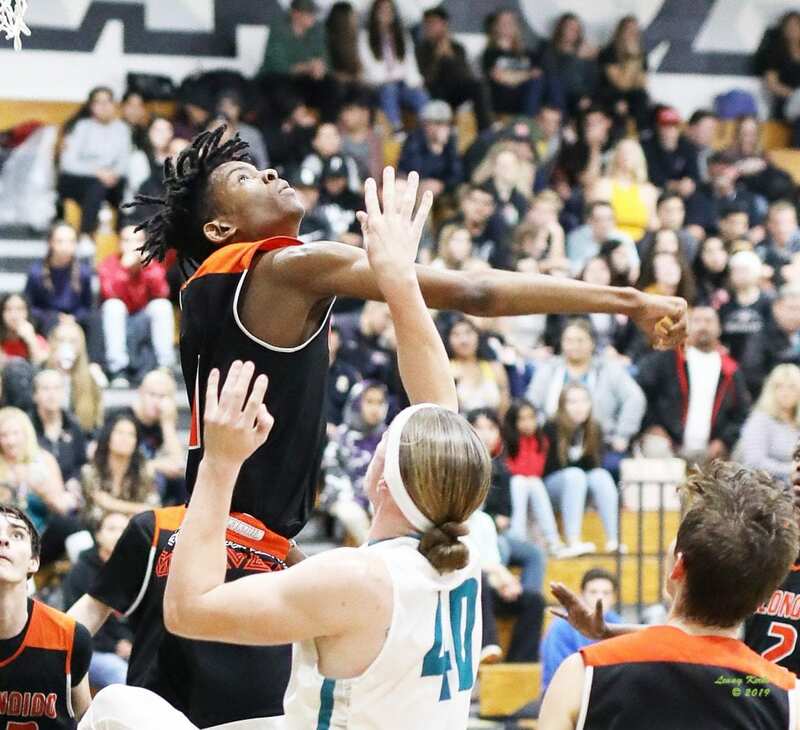 In a fascinating game that featured three rather remarkable scoring runs – two of which were fashioned by the visiting team – the Escondido High Cougars went on to secure a pivotal 77-54 victory over rival and host Valley Center last Friday night. Very few contests are capable of offering up such dramatic and extended switches in momentum as was seen up on “The Hill.” In the first half, the Cougars surged to an eye-opening 20-point advantage. But right out of the halftime break, the Jaguars electrified their home crowd by tallying 13 straight points and eventually drew well within striking distance, trailing by just four at one juncture in the third quarter. But a massive, final-period blitzkrieg by Esco (this one of 14 consecutive points) put the hammer down and salted away a game that left many in attendance a bit breathless from watching such telling changes of fortune. With the win, the Cougs of head coach Paul Baldwin captured their third straight contest, leveled their overall mark at 10-10 but more importantly, remained unbeaten in Valley League play (2-0). 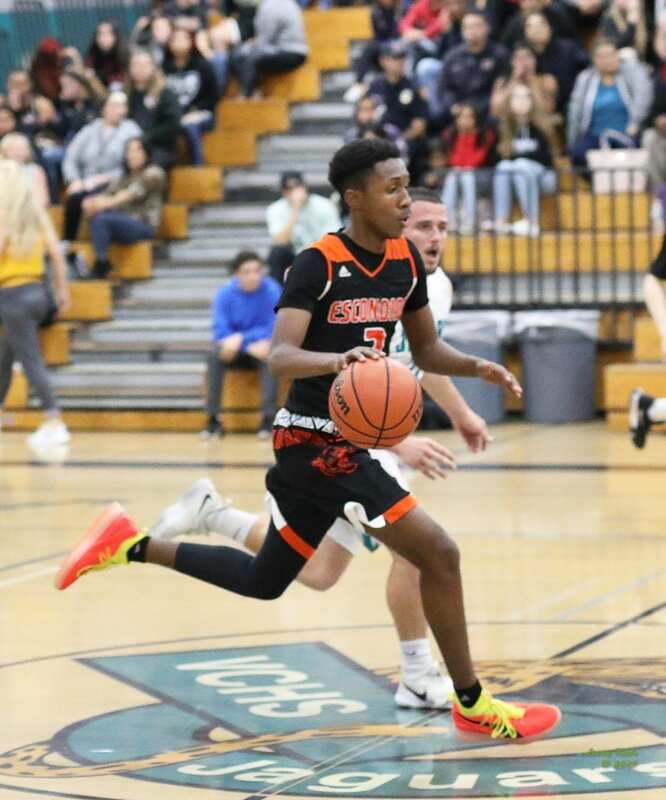 Versatile and talented guard Jacob Hutchinson was clearly Esco’s go-to performer with 24 points but he was more than ably assisted in the scoring column by wingmen Justin Fox, Brandon Goedhart and frosh Nick Payne, each of whom delivered 10. In great part because he pushed the pace in transition, Cougar Jacob Hutchinson enjoyed another productive outing with 24 points. For the Jags, who suffered a fifth setback in their last six outings, their seasonal mark dropped to 9-9 and as a result VC is still in search of that first VL win (0-2). Productive guard Kamin Davis had a solid night with 16 points while forward Rikki Mazzetti had a breakout effort by matching that same output. 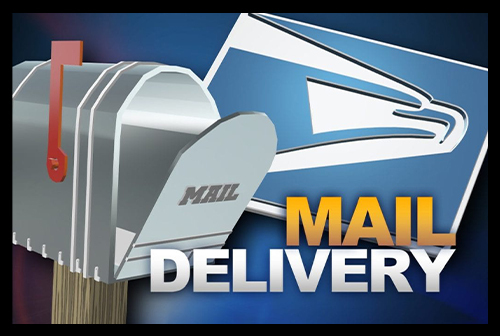 Postman Loren Diloreto was also a factor for the hosts as he reached double figures with 10. Seemingly ready from the moment they stepped off the bus, the Cougars raced to a 22-8 first- quarter lead. The youngster Payne, showing a poise not often seen from a freshman, played a huge role during this surge by drilling a pair of 3-point bombs in addition to converting a layup. Meanwhile, Hutchinson was certainly a factor as he dropped in a nice runner before swishing home a trey. Active forward Chris Landry was another contributor during this stretch with a follow-up hoop and a chippie from in close. The senior Hutchinson continued to deliver in the next period when he netted three buckets that included an artful floater. But his sophomore backcourt mate – who just so happens to be his younger brother Julian – equaled his older sibling’s production with a combo package of a deft step-back, layup and free throw. Thanks in large part to the “Hutch” bros, Esco was looking damn near unstoppable en route to forging a significant 40-23 advantage at halftime. That margin would have been even more substantial if not for the second-quarter heroics of a pair of determined Jags. Not only did Mazzetti make his presence felt with a putback and a couple of sweet swishes from downtown but he also rejected a pair Esco shot attempts with emphatic blocks. For his part, Davis demonstrated his scoring chops with a 3-point howitzer, a well-timed follow-up and finally, a feathered teardrop. As they headed to the locker room at the break, the respective coaches were certainly of opposing mindsets. Understandably, Baldwin was pleased with what he had seen, saying “We played very well in the first half.” The Esco coach also liked the way his club had pushed the pace, got out in transition and was active on the defensive end – forcing a number of turnovers with hands that, at times, appeared to be everywhere. Esco guard Brandon Goedhart drills a 3-pointer despite the defensive efforts of Kamin Davis. For VC’s Jon Jones, the story was demonstratively different. Among that which troubled him the most was the home team’s inattention to detail and blown defensive assignments. Moreover, he felt that the Jags had done too much scoreboard watching as the count against them mounted which contributed to a decided lack of focus. Before sending them out for the final 16 minutes, Jones urged his players to ignore their deficit and instead, concentrate on each and every possession. Doing that would not only make them more competitive but it just might help get them back in the game. Obviously, Jones’s words didn’t fall upon deaf ears because the Jags came out like a team possessed. First, Diloreto put in a left-handed shot from underneath. Then in succession, Nicanor Alvarado nailed a corner 3, Davis chipped in with a layup and Alvarado hit another trifecta before this startling run culminated when Mazzetti found nothing but net from way out in front. 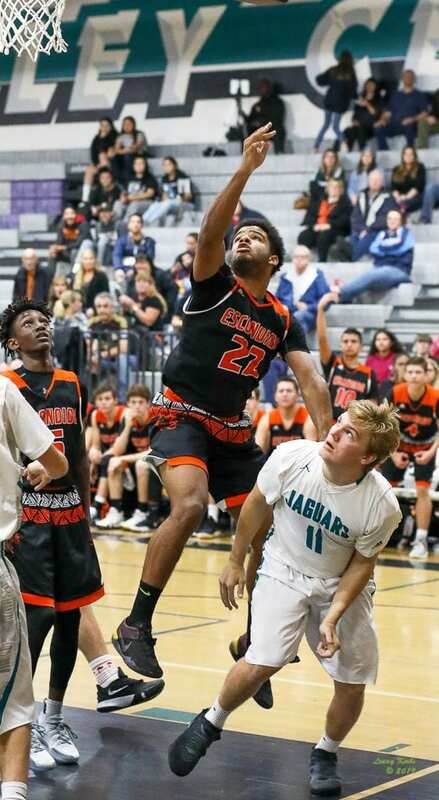 But at this critical stage and with Esco perhaps on the verge of teetering, Cougar big man Jacob Sauls stepped up in a huge way by converting a pair of free throws and a looping layup. 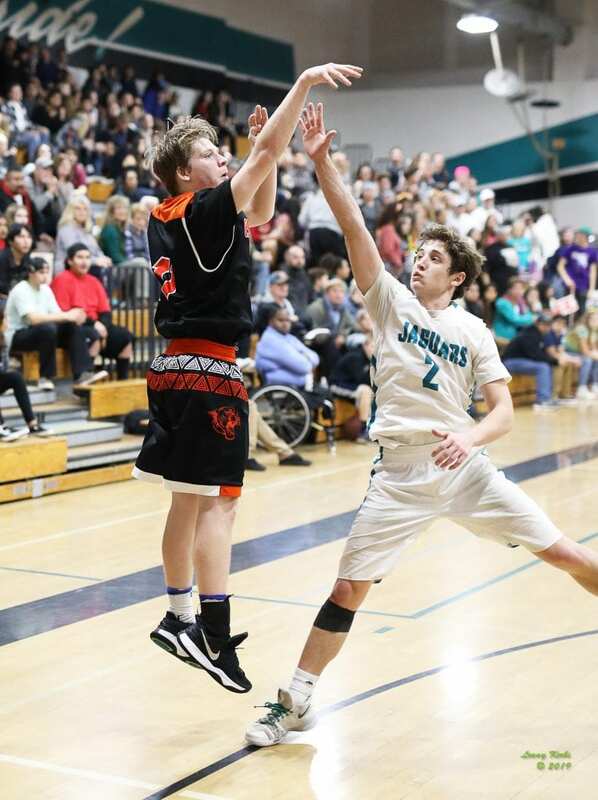 Sauls’s timely scoring seemed to settle down his team but the Jags continued to dig down deep and when guard Frank Stehly banked in a follow-shot right before the buzzer, VC was undeniably in the hunt at 55-50. However, now it was Esco’s turn to do the sizzling with a memorable 14-0 run to start the final stanza that would put the game out of reach. Julian Hutchinson kicked things off with a high-arching trey and a pair of points from the charity stripe. And from there, it was the assertive Brandon Goedhart who basically took over. The hustling junior guard helped deliver the dagger when he authored an underhand layup, a nifty pull-up pop and a deep trifecta. Goedhart’s notable performance will also be remembered for an earlier Pete Maravich-like behind-the-back pass that wowed everyone that saw it. In the game’s aftermath, Baldwin had particular praise for three of his charges. He saluted the elder Hutchinson for his “great effort,” commended Goedhart for his uncanny ability to make meaningful plays and then turned to Sauls, whom he labeled a difference-maker with his clutch points, rebounds and blocked shots. Baldwin is convinced that if the 6-6 Sauls can stay healthy and avoid the injury woes that have thus far plagued his prep career, he has the wherewithal to become a true X-factor for the Cougs. Esco’s Chris Landry watches intently to see if his close-range shot will fall through. Despite the setback, Jones was able to find some positives as well. “I was happy that in the second half, we played hard, fought back and didn’t fold. That’s an encouraging sign,” he said. The VC coach also lauded his star Davis for showing up every night, Diloreto’s overall effort and Mazzetti’s encouraging display. But moving forward, Jones realizes he must find a consistent third scoring option behind Davis and Diloreto if the Jags are to make headway and be a viable threat. Whether that means Mazzetti, Alvarado or Stehly assumes that role is yet to be seen, but one of them must ascend to a level where he is a constant factor or VC will be hard pressed to challenge in league play. What the future holds in store for both of these teams will be interesting to monitor as the season transitions into the meaty part of the VL schedule. But for now, one thing’s for sure. The Cougs have definitely demonstrated they have the capability of going on some serious runs.